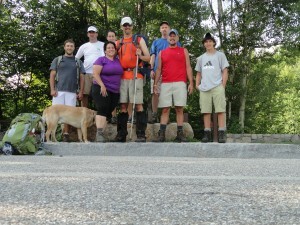 Tags: blind hiker, challenges, Hancocks, Hiking, Quinn, Randy, success. We met just beyond the infamous hairpin turn of the Kancamagus Highway in the Hancock parking area. For many 6:45 a.m. cannot constitute an idyllic Saturday morning, but the weather was perfect, the view spectacular, and our team of seven was ready for a long trek. 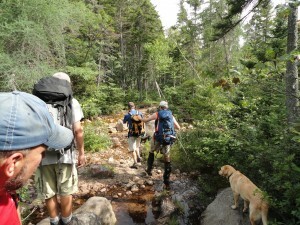 While most people do a single-day hike of the Hancock duo, the AMC guidebook suggests it as an overnight, so our early start was to ensure time for the long hike to be successful even if we were slower than the ten hours anticipated. We hike through the stream, Quinn waiting his turn. 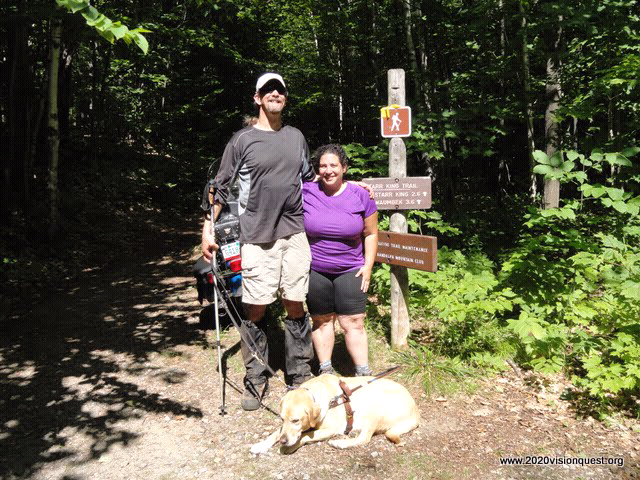 A classic “lollipop’” hike had us speeding along some relatively easy terrain as shown on the spot adventure. The primary challenge on this easy terrain were the roughly seven stream crossings, all of which could be hiked with just careful steps atop the rocky offerings. Despite the jests of whether Randy or Jennifer might perform the human Bounty Absorption test first, all remained dry. Well, all save for the Mighty Quinn, who always traverses the water directly. Averaging close to two miles per hour along the “stem” of the lollipop soon had us diverging on the loop that would take us over the two peaks and back to the stem for our hike out. We opted to hike up North Hancock first because it had more of a step terrain, harder on the descent, and ensured we achieved most of our elevation gain earlier in the day. 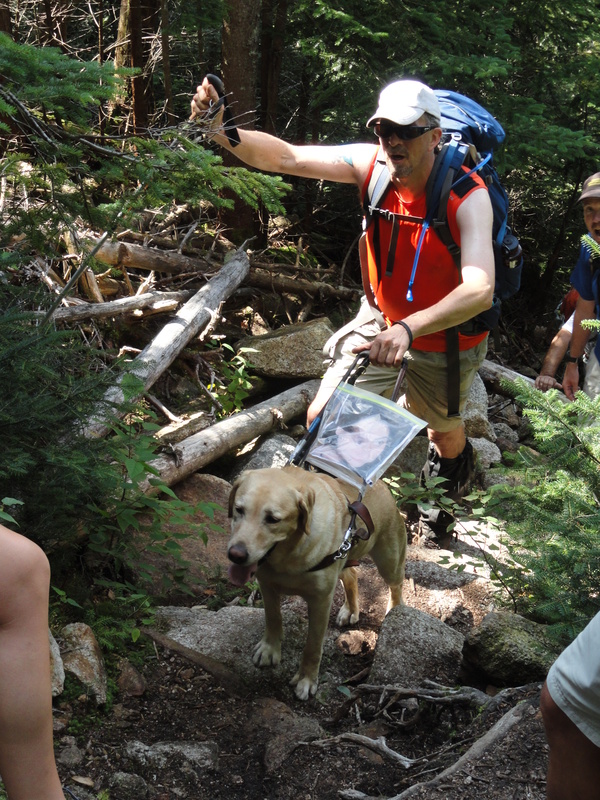 Quinn did all the work guiding to the summit and did so while carrying a tribute photograph on his harness: this hike would honor a lovely young woman who would have been celebrating her birthday had she not lost a tragic battle to a terrible disorder. She loved animals very much and her aunt wanted Quinn to celebrate her life by making her a part of this climb. Quinn was all too glad to oblige. Quinn carries a tribute to honor the memory of a friend. 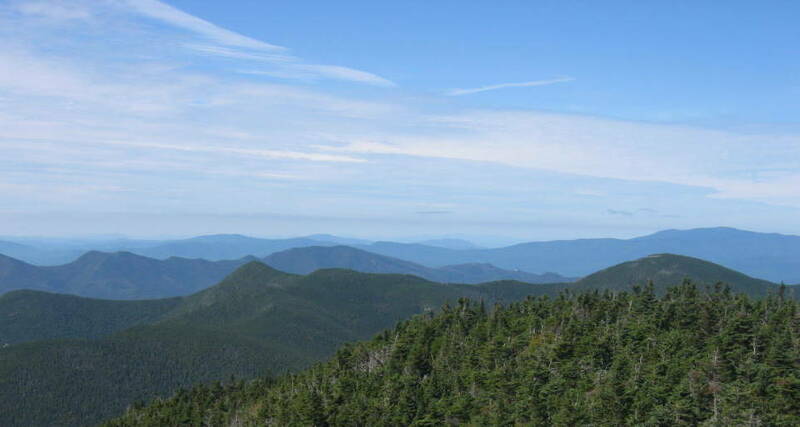 A side-trail adjacent to the summit allowed us to rest from the hard climb while sharing lunch and a spectacular view to the east and south. By this point we had already bonded well as a team and felt confident in our chances for a very successful adventure. As we resumed the hike, Jay guided me in part to handle the descent through the saddle towards South Hancock and in part to practice for the steep down that would come after the next summit. Jay had experience guiding another blind hiker and this showed quickly as we made great time through the saddle with only one exceptionally muddy region for challenge. At the next summit, we packed off for more food and to celebrate our second summit. Quinn received his tug-of-war reward and soon we started down the steep section satisfied by how well things were proceeding. Jay’s work was harder guiding me here but the real concern was the realization that Quinn’s leash had been inadvertently left at the summit sign. We realized this too late to justify returning up the mountain for it. This meant it would be difficult to work with Quinn even after the worst of the downhill had been traversed. 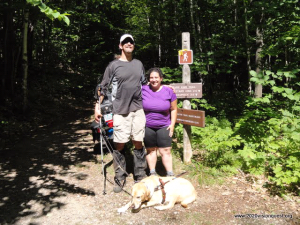 We did share a card and the story with a hiker heading up and ultimately Ryan would be a hero of the day as he not only retrieved the leash but finished the loop and caught us before we had reached the trail-head! With Quinn unleashed, Jay’s ability to endurance lead was tested. While Tracy, John, and Erik had all led me across streams and would have guided again if necessary, Jay had strong focus and deftly managed the entire second half of the hike. Even once Ryan’s heroism had returned Quinn ability to lead, Jay and I both wanted to finish the task together and have the pride of our own work together complete. Still the greater accomplishment was not the two peaks, the 1/3 mark for the 48, but the shared experiences of the entire group who finished our longest single day hike to date weary but accomplished! Tags: blind hiker, challenges, Hiking, Quinn, Randy, Trust. In planning our August 13 hike of the Hancocks, we intended to undertake a considerable distance in a single day, and it seemed likely that a human guide on the steeper ascent and descent would be beneficial. Since we had a vastly new group of hikers joining us and nobody on this hike has ever guided me on a trail, there was reason for some concern. There’s a quote I relish: “We do not plan to fail–we fail to plan.” So with this in mind, and having several years of experience with my wife Tracy, I asked her if she thought she might be ready to try her skills at guiding me on this trip if necessary. The steep trail up North Hancock has stairs, and her shorter height would actually help me work with her if we find the terrain overly slows Quinn’s and my progress together. Shorter guides on the way down are more challenging, though; on South Hancock the trail has fewer steps, which exacerbates the height challenge, but at the same time also has more of a scrambly jumble of slope which mitigates the height differential. It was a challenging request for Tracy but the terrain and timing were right for both of us to reach beyond our conventional comforts and make this attempt. After a short discussion and more consideration, we both agreed this is an excellent part of the challenge and growth we both make a regular part of our lives. We will both reach a little deeper into trust and perhaps create some strong foundations for our future hikes together. The notion alone has already increased the foundation of our relationship in taking our trust to new heights! Check back here for updates on how the hike went.